Manchester Council has finally released the dates for the 2018 Christmas Markets, due to open in and around Albert Square. A spokesperson said they will be running from Friday 9 November to Saturday 22 December. 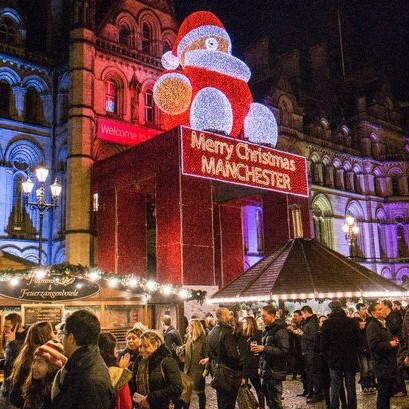 Don your Santa hat, dust off the mulled wine glass, and get into the festive spirit  its time to head down to Manchesters world famous Christmas Market. Attracting shoppers from all over the UK and beyond, the market has put Manchester city centre firmly on the Christmas map  the Christmas Market has become not just a fabulous place to shop but also a hugely popular leisure destination in its own right. No Mancunian winter is complete without a wander through the chalet-lined streets of the markets. Manchesters award-winning Christmas Markets returns this winter offering mouth-watering international food, drinks and delicately crafted Yuletide gifts in the heart of this buzzing city. With nearly 350 beautifully festooned stalls and chalets spanning 10 distinctive market sites across the city centre, the Christmas Markets are free and accessible to all. Whats Included ? Return Coach Travel. We will leave at 5pm and aim to be back into Hull for 7:15 pm.